Johannesburg. 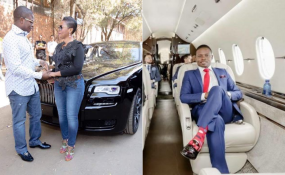 — Enlightened Christian Gathering Church (ECG) leader Prophet Shepherd Bushiri and his wife Mary have been arrested for fraud and money laundering in South Africa. The Hawks' case against the pair, concerns alleged offences of fraud, money laundering and contravention of the Prevention of Organised Crime Act. (POCA), committed from 2015, in relation to Exchange Control Regulations related to foreign currency in an amount of US$1 147 200. ECG spokesperson Maynard Manyowa confirmed the arrest. "This (Friday) morning, around 07:00 in the morning armed members of the police stormed Sparkling Waters Hotel in Rustenburg, South Africa. We were later made aware that they were members of the Directorate for Priority Investigations (Hawks). They took the Prophet and our mother Prophetess Mary Bushiri in handcuffs to Pretoria." Manyowa says the Hawks charged Bushiri with fraud and money laundering. "As you will remember, from last year, we have struggled with reports that our father was guilty."